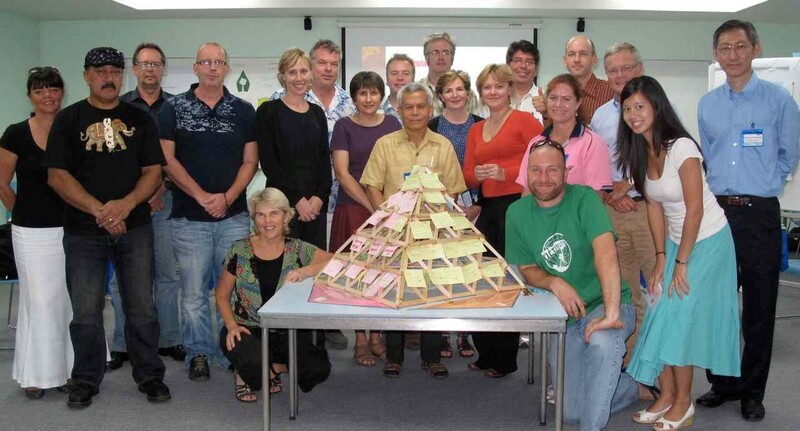 On November 5-7, 2010, the third ‘Becoming a Compass School’ workshop was held on the campus of NIST International School, Bangkok, Thailand. A diverse group of fourteen educators, school administrators and NGO representatives from China, Thailand, Vietnam, Laos and Kyrgyzstan participated in a three-day learning experience. The workshop introduced to participants the concept of Education for Sustainable Development (ESD), along with the tools and methods of the newly initiated Compass Education (a program of the AtKisson Group), including the Compass, ISIS Pyramid, and AMOEBA. The aim of this workshop was to deepen people’s knowledge and skills for incorporating sustainability into a unit lesson using the Sustainability Compass for teaching and learning, and using the ISIS Pyramid for assisting teachers and their students with project based learning design. Having NIST, one of our early Compass School practitioners, host this workshop, allowed participants to experience first hand how this school is incorporating the Compass and Pyramid in their classrooms and primary school capstone exhibition.